Dit Engelstalige e-boek wordt per email verstuurd. 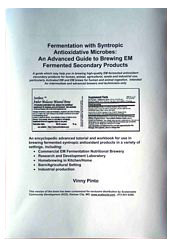 This is an encyclopedic guide and handbook which may help you in brewing high-quality EM fermented antioxidant secondary products for human, animal, agricultural, waste and industrial use. This guide contains both basic and advanced information, aimed only at the intermediate and advanced user, and including recipes, ingredients, methods and techniques, for brewing very-high quality batches of EM brews (for human use), Activated EM, aka AEM, EM Extended and EM Secondary Solution.